When you want to take advantage of the benefits of video content by publishing some of your own on your blog – there are a few things that you need to do in advance. Firstly, you need to decide exactly how you intend to publish the content on your blog and then you need to prepare your video accordingly so that everything goes off without a hitch. Essentially you will have two different ways you can publish video content on your blog. Either you can upload it to a video sharing platform (such as YouTube) and then embed it from there, or you could upload it to your webhost, and stream it to viewers yourself or provide them with a download link. To optimize videos for video sharing platforms, you will need to convert them to the recommended video format and settings. That can vary from platform to platform, and rather than keeping track of each one for yourself you can simply use Movavi Video Converter. The advantage of using Movavi Video Converter is that not only will it give you the means to convert your videos and adjust your settings as a video converter software, but it will also let you use presets that will automatically use the best format and settings for any device or platform. In this case that will mean that all you need to do is pick the presets for the video sharing platform you’re using and the software will take care of the rest. If you’re self-hosting the videos on your webhost that can be a bit trickier, but again Movavi Video Converter will help you out. 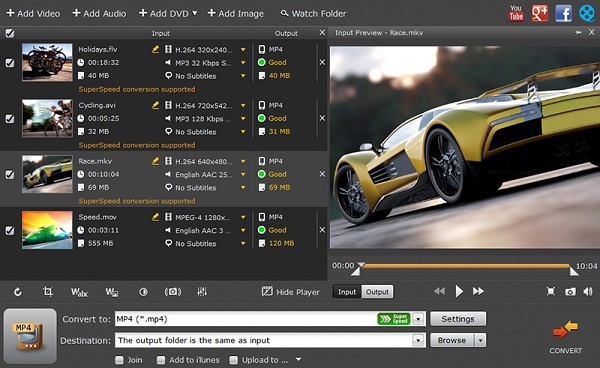 It will let you compress your video so that it consumes less bandwidth by either manually adjusting the resolution, frame rate and bitrate, or selecting the file size that you want using a slider. Needless to say it is also capable of converting the format and codec to a more compression-friendly variety so that you are able to really reduce the file size by quite a bit. Alongside all these features, Movavi Video Converter also includes numerous others that will help you to prepare your videos before you upload them to your blog. Its video editing features will be particularly useful, and will let you trim out unnecessary segments from your video, improve its quality, add customizable text, and crop or rotate the video. On top of that you could also use it to convert audio and image files, extract the audio from video, or create animated GIFs out of video clips to use on your blog. As you delve into the capabilities of Movavi Video Converter, you’ll soon start to see how it could give you the means to create new types of content from your videos too.